Winter is passing and I’m certainly looking forward to the spring! I’ve had some great viewing sessions since my last post just over a month ago. Mostly galaxies on my Herschel 400 list. I’ve now viewed 329 out of 400. On the Messier list I’ve got 107 out of 110. I’ll probably get the Messier completed sometime in April and the Herschel 400 sometime in May or June. I’ve just got to wait for the objects to become available in the sky again! Next on the list of observation programs: The Herschel II and the Lunar I program. There are 40+ programs offered by the Astro League. I’m looking forward to them! Before I get into some of the Herschel highlights, I’ll note two very cool observations. 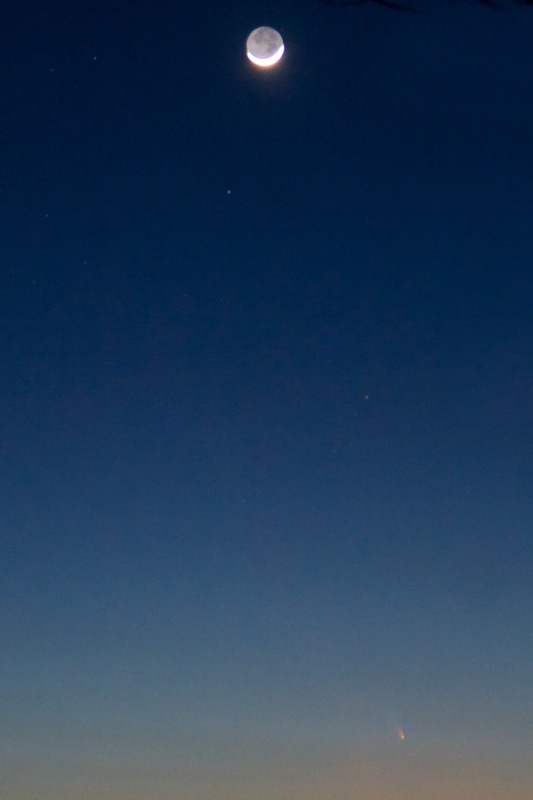 Most recently, last night in fact, I got a look at Comet Panstarrs C/2011 L4. It is currently viewable just after sunset. I caught it at about 7:40pm halfway between the moon and horizon. Just barely visible to the naked eye, it is best viewed with binoculars or telescope. I had a very nice view of it with the 8″ dobsonian. With the 30mm eyepiece the tail is nicely defined and the comet core is very bright! Photo was taken at ISO 800 at 85mm, about a 2 second exposure. Comet is in the bottom right. The moon was nicely lit with reflected light from the earth called earthshine. As of now the comet has completed its orbit around the sun and is moving back towards us and into its tail. The second observation was that of the asteroid, 2012 DA14, that made a close flyby of the Earth on February 15th which by chance, was the day that a meteor exploded over Chelyabinsk, Russia. My observation of 2012 DA14 didn’t last long thanks to the clouds but I had it for five minutes or so… As expected, it looked like a faint, small, slightly fuzzy star slowly moving through the eyepiece. Pretty neat to observe it. I’ve looked at more than 50 galaxies and clusters since my last post so I’m just choosing a couple to mention here. The first I observed on February 13, the irregular galaxy NGC 4449, in the constellation Canes Venatici. It is located about 12 million light-years away, part of the M94 Group (the Canes Venatici I Group), a galaxy group relatively close to the Local Group containing the Milky Way. A very interesting object to observe because of it’s shape and the fact that some detail is visible in the eyepiece. Obviously, no color but some mottling is visible. 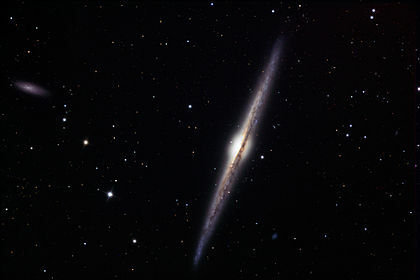 Another galaxy, viewed on March 7, was NGC 4565, The Needle Galaxy and this was quite stunning. Similar to NGC 4710, in that it is an edge-on spiral galaxy. It is about 30 to 50 million light-years away in the constellation Coma Berenices. It is a stunning object in the eye piece. What makes it nice to look at is that dark lane of light absorbing molecules that extends across it, blocking the light. A very nice detail that can also be observed in the Somrero galaxy, NGC 4594. The Bad Astronomer, Phil Plait has an excellent write up about on edge galaxies. The Eastern Ozarks Astronomical Society continues to meet regularly to observe and we have also begun our efforts at community outreach. Hoping to have more to report on that soon. One last thing I’ll add and that is that there is so much happening right now in the field of astronomy. Between the Mars Curiosity discoveries as well as the many other discoveries concerning the Higgs Boson, exoplanets, it’s hard to keep up with it all! This entry was posted in Asteroid, Astronomy, Comet, Meteor on March 14, 2013 by Denny. 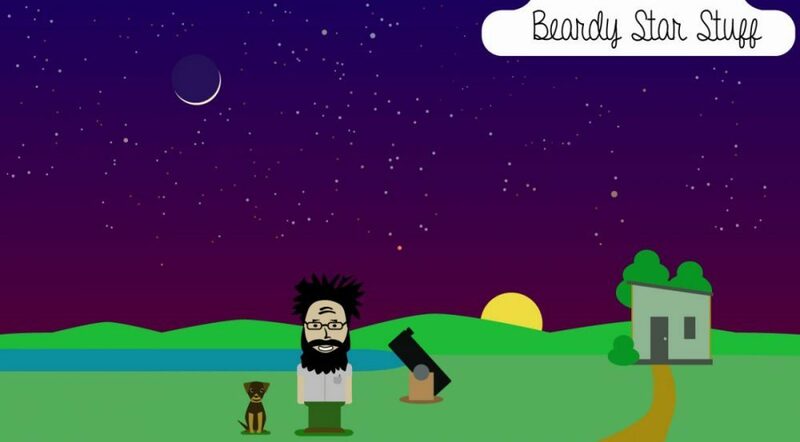 Seems a great opportunity to recommend these fine posts about observation by philosopher Levi Bryant in the hopes it may enrich even further your observations of the night sky.